Like those in its sister community, Tides End homes for sale nestle on a tranquil setting. These residential choices sit on a 19.6-acre site on 9523 17th Avenue West which directly abuts westward the Palma Sola Botanical Park and the Geraldson Community Farm. As a further enhancement of the community’s serene location, Neal set a one-acre park at the center of Tides End’s acreage, and it platted the property for 38 home sites several of which are adjacent to a lake. 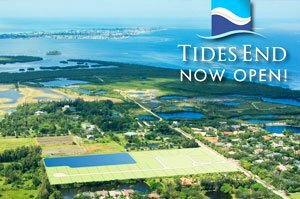 The Tides End project may be rightly called an “infill development,” as several other residential subdivisions have been established around its perimeter with some having listings of pre-owned Bradenton homes for sale. Directly across the street north of Tides End are the neighborhoods of The Loop and Mango Park, while Fiddler’s Green and Hawthorn Park are on this Neal development’s east side. Prospective buyers of Tides End homes for sale can choose from five floor plans measuring from 2,698 to 3,346 square feet with three to four bedrooms and three to four baths. All featuring a three-car garage, these home models are priced starting at the $400s up to the mid-$500s. One model, the Kiawah, positioned at the higher Tides End price point was notably a standout in the 2018 Sarasota Manatee Parade of Homes (POH). This design, which features four bedrooms and three baths within a floor area of 2,907 square feet, was named in its POH category as the Best in Master Suite. 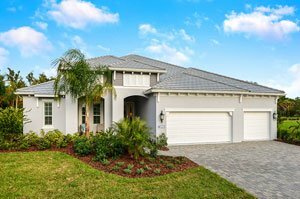 The coastal-inspired Tides End homes for sale are a perfect match for its northwest Bradenton locality. This area is largely dominated by the 600-acre-plus Robinson Preserve, a coastal sanctuary for flora and fauna just west of Tides End. A multi-million dollar expansion has been undertaken for this coastal preserve, with one of its major components completed and opened February 2018. This nature park feature, which should provide an added perk for living in Tides End, is called the Mosaic Center for Nature, Exploration, Science and Technology (NEST), a 3,541-square-foot facility built at a cost of $3.8 million. 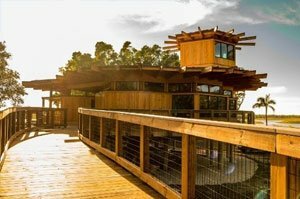 NEST provides a treehouse-like environmental classroom for educational programs as well as other events like corporate retreats and weddings. The Robinson Preserve’s expansion is likewise bringing in pathways, bike trails, a canopy walk viewing mound, kayak and canoe launch, and paddling trails. The project aims to restore the preserve’s coastal area to its natural state of mangrove islands, wetlands, and marine habitats for juvenile snook. Aside from Robinson Preserve, Tides End is convenient to the beaches of Anna Maria Island. These are easily accessible westward at via Manatee Avenue West, a road corridor that also opens easy access not only to local urban life and leisure centers but also to top-rated Bradenton schools. Below are the current real estate listings available at Tides End.